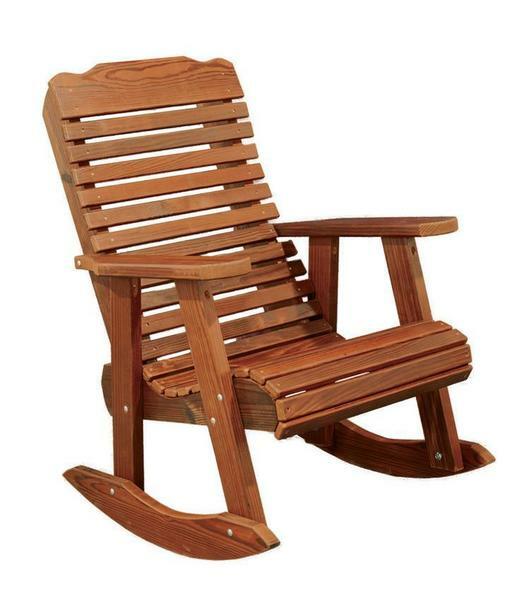 Total back support is included in the design of the Amish Cedar Wood Contoured Rocking Chair. This solid wood beauty is a lovely addition to your outdoor furniture collection. Completely contoured to wrap you in comfort, this is the rocking chair to look forward to on your porch, patio or out in your backyard area. Full of strong qualities you'll love along with a stylish form to boot, this cedar outdoor furniture makes for a winning scene outside. Rich with solid wood slats, wide arm rests, a shapely chair crown and a supportive seat, this cedar rocker is yours for afternoon reading, morning coffee or a luxurious nap out in the fresh air. Wooden outdoor furniture from DutchCrafters means quality, durability and style you can count on. This outdoor rocker is made in Goshen, Indiana by skilled Amish craftsmen. Using thermally modified wood means this wood chair is protected against splintering, warping, rot and decay. The sealant used is chemical free, making this outdoor furniture a great choice for a green household.